Isn’t this cute? Funny thing was, my mom bought me Nana’s Kids paper pack and the same day bought a ribbon stack from a totally different brand, actually in the $1 bin. She wasn’t trying to buy matching stuff but they match really well-AWESOME! And they ribbon was still sitting on my desk so I didn’t even have to search for ribbon for this card. The whole card looks more vibrant IRL so the ribbon matches better. Can you see the glittered stars on this paper? Super cute!! I kinda wish the sentiment was a bit lower but oh, well. Paper: DCWV, turquoise, purple, white CS-SU! That's adorable! 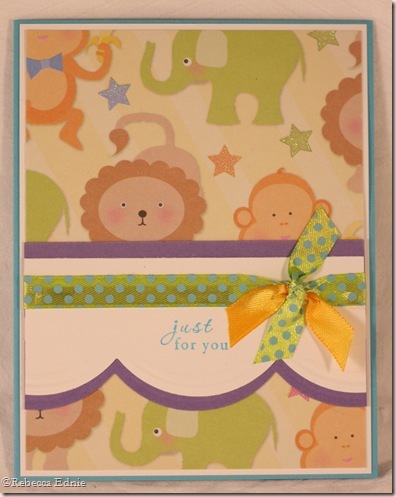 It's just the look I like for baby cards — I'm not so much into the pink and blue baby carriages.